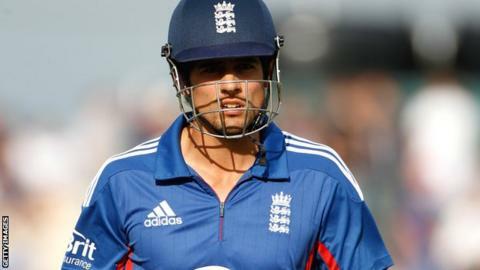 Captain Alastair Cook said lessons were learned from England's 3-2 one-day international series defeat in India. Having lost three matches in succession, England finished the tour with a seven-wicket win in Dharamsala. "It's disappointing in a couple of those games we didn't play as well as we could have done but we've learned a lot about certain players," Cook said. "When we played well we showed we're a match for anyone and to win twice out here, we can be quite proud of that." The five-match series was England's first under new one-day coach Ashley Giles and their first opportunity to play under the new ODI rules, which dispense with the bowling powerplay and allow a maximum of four fielders outside the 30-yard circle during non powerplay overs. Ian Bell, who made 85 in the first match and an unbeaten 113 in the closing victory, finished as England's leading runscorer with 234 runs at an average of 58, while Kent spinner James Tredwell, in for the rested Graeme Swann on the trip, was the top wicket-taker with 11 at a cost of 18 apiece. "We've all learned a lot from this tour," Cook said in Dharamsala. "It's the first time with the new regulations and my stand-out performance was the way Tredders [Tredwell] bowled today, he's been fantastic all tour he just gets on with his job and it's great to have such strength in depth in that department." England were dismissed for 155 and 158 during the series but finished with a win after bowling out their hosts for the first time in the five matches and reaching their target of 227 with 16 balls to spare. "I thought the way we learnt throughout this tour showed quite nicely in that game," Cook added. "We bowled a bit better, yes conditions were a bit more in our favour, but we used that and put the ball in a lot of challenging areas and when you get the opposition 50-4 you put yourselves in a very strong place. "When we got Dhoni out as well we were right on top, and we knew chasing 220 with these new regulations, if we had wickets in hand towards the end, we should get there. I thought the way Ian Bell played was fantastic. "It's disappointing in a couple of those games we didn't play as well as we could have done and that's slightly frustrating but with a young squad we've learned a lot about certain players, Joe Root has come in and done very well, Steven Finn has done very well as well so we've learned a lot and the relationship with Gilo has gone nicely." Bell who passed 4,000 ODI runs and recorded his third century - the other two both at Southampton - was named man-of-the-match and said: "Our bowlers set the tone and 220 was a nice target to go after. Throughout my one-day career I seem to have got good starts and not gone on so to be not out at the end of the game is a massive step forward. "We came here to win the series but there are some good things we can take from it."